Published by Cyril Huze April 29th, 2016	in Editorial. You can improve the appearance of your touring gas tank using this Klock Werks low profile, laser cut dash panel made in the USA from 16-gauge stamped steel, then e-coated to prevent rust and corrosion. Looks great painted or chrome plated. The company offers a chrome ignition switch cover to compliment the it perfectly . This dash is available in a variety of lengths to accommodate different seat styles. Two lengths (short and long) for ‘08 and newer baggers (08-up FLHT, FLTR, FLHX and HD FL Trike Models), and in three lengths (short, long, and extended) for 97–07 FLHT, FLTR, FLHX. Low profile vented caps are recommended and sold separately. Softail riders can achieve a more streamlined look that visually increases the length of the tank without actually stretching it. 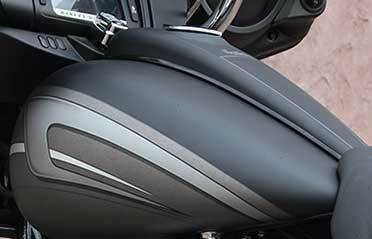 The Metal Dash for Softail comes as a dash and ignition relocation kit. The kit uses the stock ignition switch and key. The show-chromed ignition mount replaces the obtrusive horn mount (requires horn relocation). Fitments are available for ‘00+ FXST, FLST models (except FXS, FXSTD). All these dashes accept most aftermarket low-profile vented fuel caps. Installation is simple, and dash trim is included. Available online at Kustom Baggers or through your local Drag Specialties dealer. Soon to be copied…by Harley. Clean looking…never did appreciate the baby moon hubcap left to cover the hole where the speedo used to be; seemed like an expedient move more than a true re-style on HD’s part.